Evolve doesn't have a release date yet but you can still preorder now to get the Monster Expansion Pack at no extra charge. It was actually a full week ago that we got our first look at Evolve, the four-on-one multiplayer shooter from Left 4 Dead developer Turtle Rock Studios, but today 2K Games made it official with an announcement that the game is in fact in development. 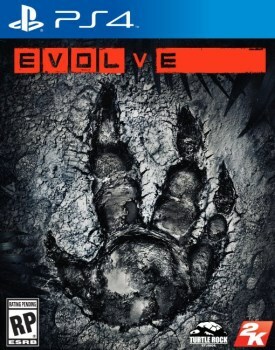 The press release didn't say much more about the game than was revealed by Game Informer, although it did reveal that Evolve's perspective will change depending on which side you're playing - first-person as a hunter, third-person as the monster. 2K also announced that while Evolve doesn't have a release date, preorders are now being taken. Gamers who pony up some advance cash will get the Monster Expansion Pack DLC as a bonus, which will include the "Savage Goliath" skin at launch and a new monster character that will be developed after release. The Evolve cover art was also revealed and I don't think it's unfair to say that it's just a wee little bit reminiscent of the great Left 4 Dead cover. It feels a little early in the game to be throwing around preorder bonuses, but Evolve does look promising, at least based on what little we know of it at this point - which I admit isn't much. Fortunately, there's plenty of time to make up your mind: Evolve isn't slated to come out until sometime in autumn 2014.